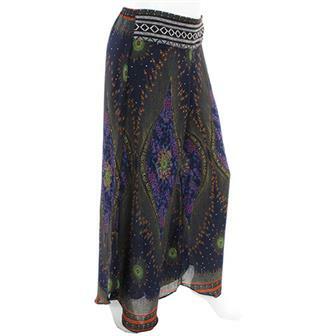 Funky and Fair Trade, our trousers are the last word in hippy and bohemian chic. We've got classic Nepalese stripes, fresh patchwork threads and the best in Thai elephant print. Guys, check the range of summer shorts for kicking it in the sun; Gals, check out the tie dye leggings for colour spinning pins. 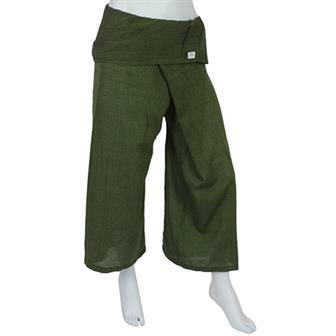 Fantastic lightweight Cotton ¾ length fisherman trousers, these trousers require a little skill in tying up, but have no fear the matching fabric bag has instructions on how to wear. 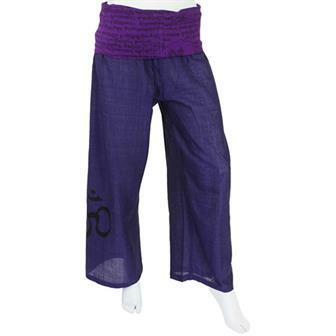 They have a lovely loose fit which allows for full leg movement making them ideal for yoga, pilates etc. They are also tied with drawstring so one size fits all. 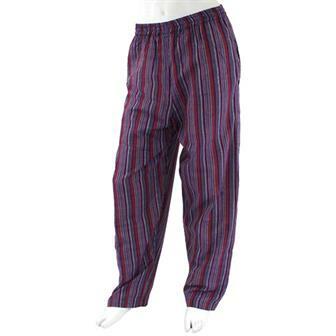 Striking trousers made from the beautiful and traditional ikat fabric. Each pair of these comfy trousers have an elasticated waist and pockets. Supremely comfortable lightweight trousers with an elegant peacock design print and an elasticated waist adorned with a woven trim. These comfortable cotton trousers feature a fold-over waist hem with drawstring tie. Ideal for yoga, gentle exercise or lounging about in. The material at the waist features designs similar to Tibetan prayer flags and can incorporate Lungta, The Windhorse, Buddha and Sanskirt text. The leg features a large printed Om symbol. 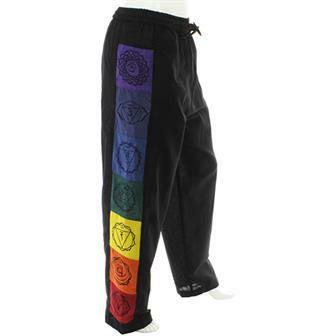 Simple black cotton trousers with elasticated waist, embellished with colourful panels of chakra symbols running down the right hand leg. These trousers are ideal for summer due to their comfy nature. 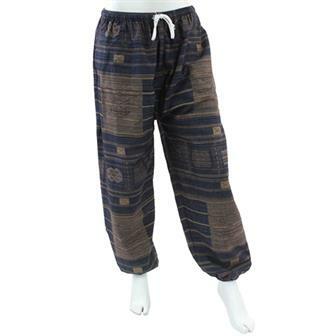 Long flowing butterfly cut trousers from Bali, these trousers are made with panels of silken feeling rayon that layer over each other to produce a wide flared leg. They are finished with a drawstring tie around the waist. These great heavy cotton trousers come in a variety of patterns and colours and feature a drawstring elastic waist and elastic ankles. 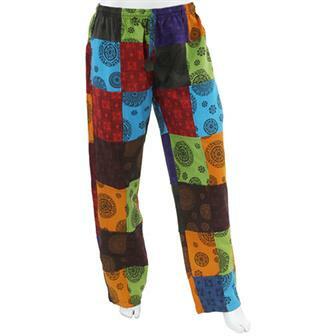 Made from a patchwork of different brightly coloured materials, these trousers are a real delight for the eyes! 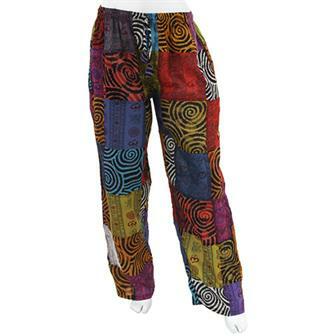 Handmade in Nepal, they have elasticated waists for comfort and lined pockets. 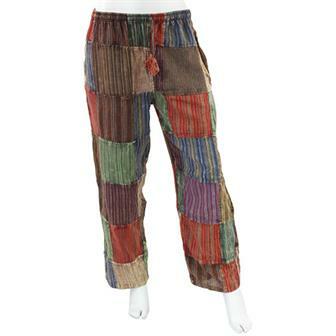 A magnificent mish mash of intricately patterned thick cotton patches have been stitched together to make these incredibly comfortable and unique trousers. 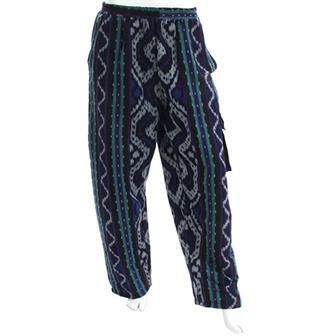 Handmade in Nepal, they are available in three sizes and have an elasticated waist with a drawstring tie, two large hip pockets and one back pocket. Made using patches of different coloured striped material, these super slacks boast not only a fantastic, eye catching style but also wonderful comfort and freedom with their loose fit and elasticated waist. 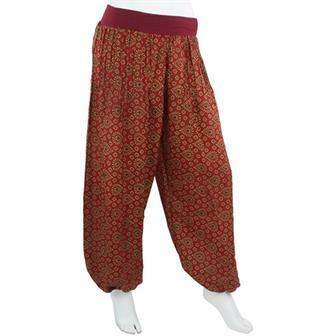 These fabulous medium weight Nepalese pure cotton trousers are supremely comfortable with their elasticated waist and loose fit style. Available in a selection of vibrant striped colours, they have two hip pockets and are the perfect trouser choice for lounging!